Pullbox Reviews: Power Up – From working class hero to Superhero! “When they first looked up and began to chart the skies, they predicted: ‘A star will die as another is born, and so will they be chosen. Four warriors to champion us into a new age- a time of peace… of strength… of celebration. In the oldest language, by the wisest hands, it was written. Aimee Bloom, age 23. A mild mannered employee in a mild mannered pet store… In her day to day life, her biggest problems are remembering to buy milk for her breakfast and the bus getting her to work on time. Until (duhn Duhn DUHN!) a mysterious light bursts into the pet shop, hitting her and Silas the goldfish (you heard me, I said “goldfish”). Still reeling from the occurrence, Aimee and Silas are attacked by a Lovecraftian nightmare wearing a dapper business suit (I’m not making it up, I swear), and they discover that they have been gifted with amazing cosmic power! This series has every indication of being, at the very least, unconventional. The artwork is more stylized than most comics, looking more reminiscent of the old “Cathy” newspaper comic strips than a comic book series involving ancient prophecies and battles between good and evil. Personally, I like left-of-center. 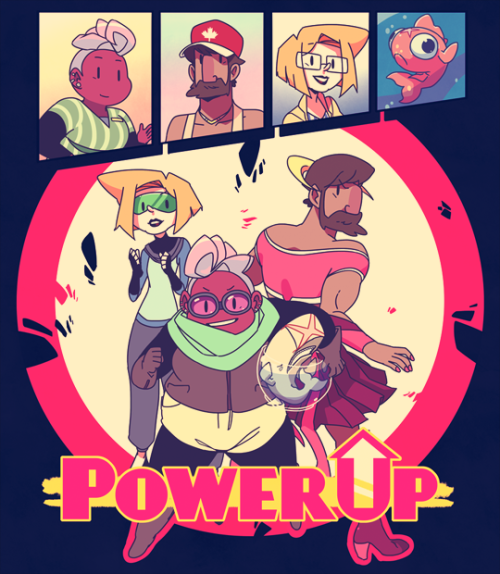 The tone of Power Up looks like it’s going to bring that in heavy doses as we’re introduced Aimee, the “EveryMan” (er… Woman) hero, and her world of ups and downs. And remember… the prophecy said there would be FOUR warriors. We’ve got Aimee. We’ve got Silas. Who will come next?